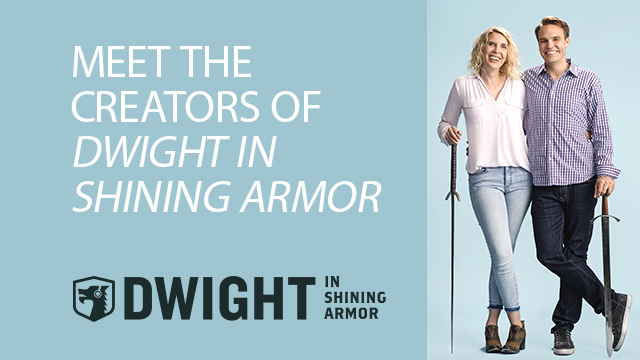 Dwight in Shining Armor premieres in March 2019 and to get you ready for the spectacular premiere, we sat down with the show creators, LeeAnne H. and Brian J. Adams! 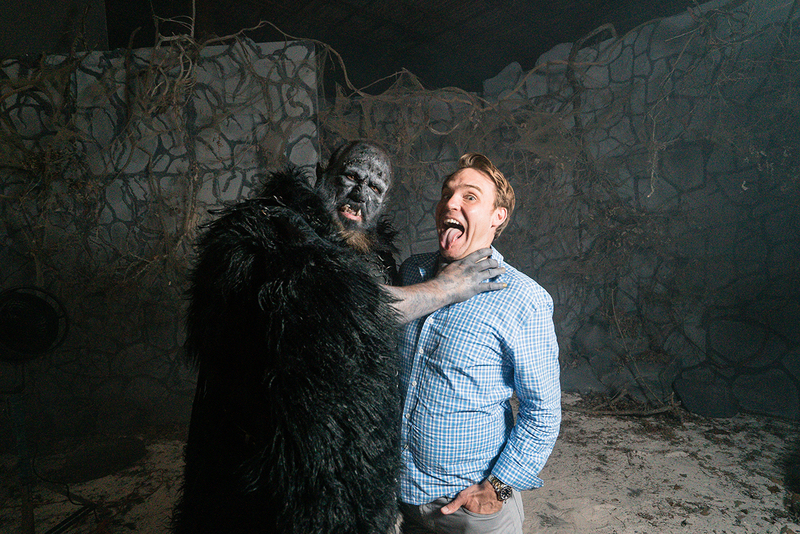 Get the ultimate insider view on Dwight in Shining Armor below! LeeAnne: We created Dwight in Shining Armor. We're the writers and showrunners. Brian: We have a lot of titles. Writers, showrunners, creators, executive producers. We have too many titles. Brian: Dwight in Shining Armor, it's a story about the nicest kid in the world. One day he's walking in the woods, and he falls through what turns out to be the rotted roof of an ancient castle. LeeAnne: So he lands lip-to-lip with a warrior princess who has been magically sleeping for about 1,000 years. LeeAnne: He wakes her up with his kiss, and he also wakes up everyone who was in the woods the day that the spell was cast. The spell was called the champion spell. Brian: It was like a spell of last resort. They were totally under siege, and the magician, Baldric, didn't know what to do, so he's like, I'm just going to put everyone to sleep until some champion, awesome guy, gets here to handle all this. LeeAnne: To handle all the bad guys, and that accidentally ends up being Dwight. 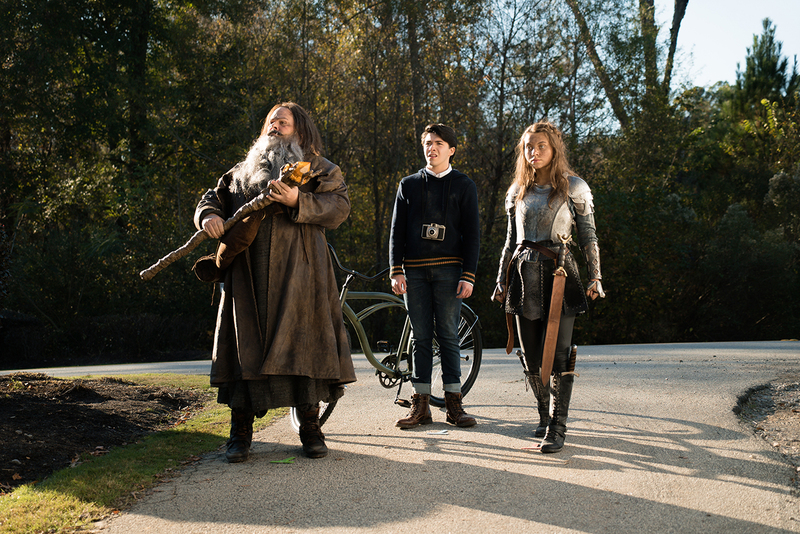 Brian: And they're off on their adventure, right? LeeAnne: When we came up with this concept for this show, our intention was that there would be a little something for everybody. That kids and teens and their parents and grandparents would all find something in it that they could relate to and enjoy and appreciate. BYUtv: What do you want viewers to take away from the show? LeeAnne: There are a few takeaways I think. The first is that there's a lot of ways to be a champion. Dwight becomes Gretta's champion very much by accident. He's uncomfortable in the role, but what they find very quickly is that he's the champion she needs. Brian: You can get in situations that seem totally unsolvable, get in a bad situation that seems like you can't get out of it, and you're stronger than you think. You probably can get out of it using whatever skill set you happen to have developed. BYUtv: What would you like to say to future fans of the show? LeeAnne: We hope you love it. As long as you guys are loving it, we will keep making it. Brian: It just keeps getting better. LeeAnne: It'll get better and better. Brian: As we continue to learn, as the actors get more into their characters, it just gets better and better, so stick with it.